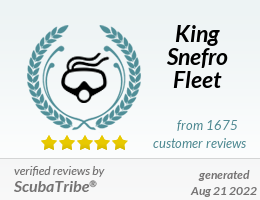 King Snefro Liveaboards - Red Sea Liveaboards, Safari Routes, Dive Sites -Chrisoula K.
Home » Dive Sites » Abu Nuhas & Wrecks » Chrisoula K.
The "Chrisoula K." had completed the loading of a cargo of Italian floor tiles. The Captain had to negotiate the narrow confines of the Gulf of Suez - during which he insisted on giving his personal attention till the vessel finally approached the Strait of Gubal. He had been on the bridge for more than 2 days, was finally able to relax and hand over control on 31st August 1981. Soon after, with the engines set at full speed the "Chrisoula K." struck hard into the northeast corner of Sha'ab Abu Nuhas, sustaining serious damage and considered a total loss. Today, the "Chrisoula K." can be found where falling of the reef. Lying on its starboard side the main body is generally upright with the cargo still in place. The stern, with the large propeller and rudder, lies at a depth of 28 m in rather good condition. Deep inside the stern, the engine room can be visited but extreme caution is necessary as the wreck is now instable. Experience of such diving plus a torch and back-up torch is essential. In fact, it is better not to enter the ship here, don't take a risk. If you like, enter one of the holds and you can see the packed floor tiles still carefully bound together. The wreck's superstructure is highly damaged, provides plenty of easy swim-through and natural-light. From the almost vertical decks above, the rear mast hangs in mid-water almost parallel to the seabed. The decks are overgrown by corals with all the popular reef fishes to find. The whole wreck is covered with encrusting sponges and colourful soft corals. Large morays live in the scattered remains of wreckage and batfish circle the topside. As well look at the very interesting area between the wreck and the eastern part of the reef.